Turkey & Rice Kibble is a wholesome and natural hypo-allergenic dog food for loose bowels and for calming itchy and irritated skin and coat. The benefits' of turkey provides an all round goodness compared to chicken, as some dogs have developed an hypersensitivity to chicken due to over-exposure in dog food. Turkey is a brilliant alternative white meat as it is very gentle on the digestive tract. Additives per kg - antioxidants: E306/Natural antioxidant. 177 mg, Vitamins: E672/Vitamin A, 15000 iu,E671/Vitamin D3, 1400 iu, Trace elements: E1/iron, 133 mg E2/iodine, 3.3 mg, E4/copper, 20 mg E5/manganese, 40 mg, E6/zinc, 385 mg, E8/selenium, 0.44 mg. 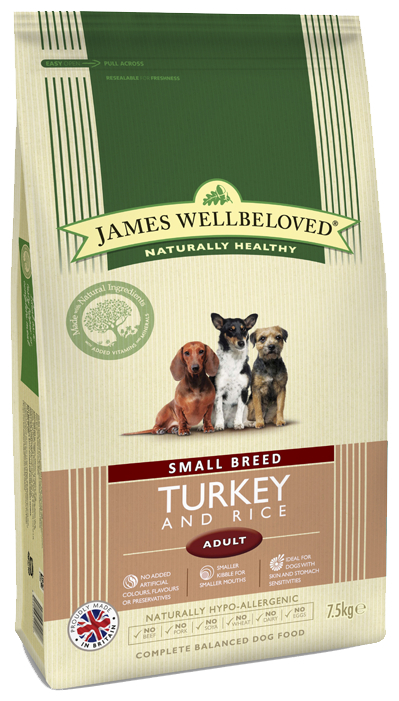 There are currently no questions for James Wellbeloved Adult Maintenance Turkey & Rice Dog Food - be the first to ask one!